What Would it Take to Overcome Exclusionary Barriers, and Promote More Affordable Options in All Neighborhoods? What would it take to make new neighborhoods, and remake old ones, so that large, complex, metropolitan areas moved decisively toward racial and economic integration? What local and regional governance strategies could most effectively overcome barriers to these goals? Pathways to Inclusion: Contexts for Neighborhood Integration in Chicago, Houston, and Washington, by Rolf Pendall, who moderated this panel at our symposium, offers an overview of the major demographic changes that are transforming US housing markets and describes two distinct patterns of political geography that will affect local and regional decisionmaking about neighborhood inclusion. He begins by reporting that the population of the United States – particularly its metropolitan areas – is both growing and becoming more diverse by age, race and ethnicity, household composition, and income. He then describes the two principal patterns of political geography that affect decisionmaking about neighborhood inclusion: fragmentation of local governments (particularly in the Northeast and Midwest where control of land use is in the hands of many local governments) and polycentricity (particularly in the South and the West, where larger county governments have much more control over land uses). Fostering inclusion in both types of places is challenging. In the former regions, he notes, it tends to require state-level action. In the latter, the efforts often focus on school districts as well as school assignment zones within particularly large school districts. He concludes by showing the interplay between the national demographic trends and political geographies of the three case study regions. An Equitable Future for the Washington, DC Region? : A "Regionalism Light" Approach to Building, by Willow Lung-Amam, begins by noting that while that DC region is racially and economically diverse, it also is highly segregated and has some of the nation's highest housing prices. Moreover, because it is politically fragmented, it has uneven patterns of development. Given this, Lung-Aman proposes a “regionalism-light” approach that focuses on the protection and production of affordable housing. In particular, she says four approaches should be the central part of any effort to break down barriers to housing inclusion in existing neighborhoods and build a strong platform for current and future residents to be a part of the region’s continued growth and prosperity: preserving existing affordable units through aggressive anti-displacement strategies; capturing land value to produce new affordable housing, especially near transit stations; increasing the density and diversity of suburban housing; and tackling the region’s stark east-west divide with fair-share policies. Can a Market-Oriented City Also Be Inclusive?, by William Fulton, explains that while Houston has emerged in the last 30-plus years as one of the country's most ethnically diverse and affordable cities, these measures mask significant amounts of inequality and disparity that are at least as bad as, and perhaps worse than, those in other metro areas. At first glance, he notes, Houston seems unable to address these challenges, largely because it has a reputation for being one of the nation’s most market-oriented cities for real estate development. However, he contends, the city has a unique and important opportunity to address these issues because it also has abundant amounts of vacant land, limited zoning regulations that could block the development of affordable housing, regulatory tools that could encourage such development, and a potentially useful but currently uncoordinated set of financial incentives for economic development and real estate development. Accomplishing this task, he explains, would require both a comprehensive citywide approach and targeted efforts in underserved neighborhoods threatened by gentrification. In particular, the following strategies are especially promising: aligning both economic development incentives and regulations with inclusiveness goals; using government and institutional landholdings to strategically to pursue those goals; and creating a broad and comprehensive approach to inclusiveness that includes both underserved and high-opportunity areas. He notes that while Houston has taken some steps in this direction, it has fallen short in others, particularly in efforts to bring affordable housing to high-opportunity areas. Two Extremes of Residential Segregation: Chicago's Separate Worlds & Policy Strategies for Integraion, by Marisa Novara and Amy Khare, argues that a movement is needed to rethink strategies for desgregation at the region's two poles: concentrated poverty and concentrated wealth. The Chicago region, they note, ranks in the top quarter of all metros with regard to economic segregation and is in danger of becoming even more segregated by race and class. In areas suffering from disinvestment, Novara and Khare argue that carefully revised lending criteria and improved appraisal processes, along with other complimentary policies, could lead to increased investment. This, in turn, might create more integrated communities. In contrast, they note that political realities make it unlikely that the state will step in to override local land-use restrictions that stymie the development of affordable housing (as Massachusetts has done via a law passed in 1969). Given this situation, they suggest that Illinois instead draw on a different Massachusetts law that offers incentives to more affluent communities that zone for dense, mixed-income residential developments, particularly in locations well-served by transit. Following the release of our America's Rental Housing report last month, one of the most common questions has been: "Which findings are new or surprising to you?" This is never an easy question to answer, and different readers are likely to find different aspects of the report surprising. Nevertheless, the list below contains the 10 findings that were, in some way, new or surprising to me. Some reflect new trends, some are the result of new analyses and/or data sources, and some are longstanding findings that I continue to find astonishing. 1. The rental stock grew, and all growth has been among units renting for over $850/month. 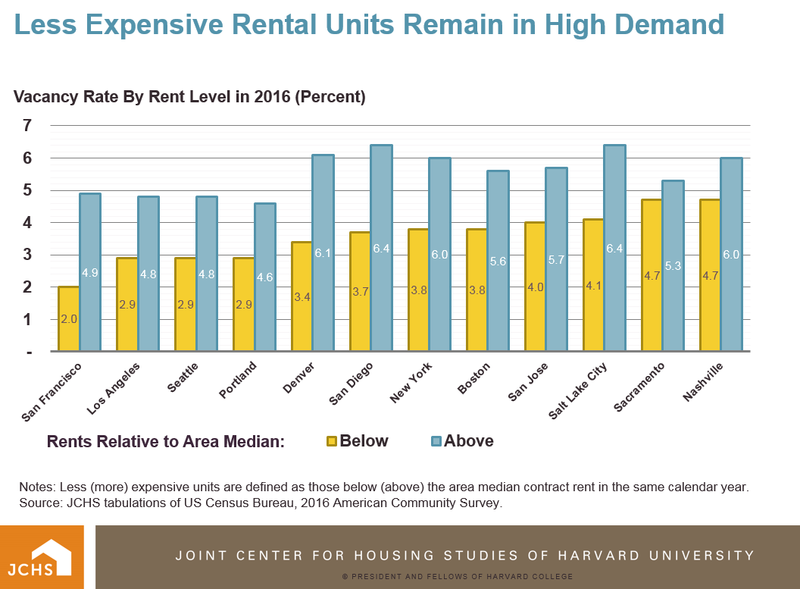 While the total number of rental units in the US increased by 7.2 million between 2006 and 2016, in constant dollars, there was nearly no increase in the number of units renting for less than $850 per month, and the number of units renting for less than $650 fell by 475,000 units. In contrast, units renting for $850 or more accounted for the entirety of the growth, with 53 percent coming from units renting for over $1,500 per month. As our interactive tool shows, the lack of growth in low-cost units occurred in a wide variety of metro areas. 2. New rental starts slowed in 2017. Construction starts of new multifamily units are down 9 percent year-over-year through October 2017 on a seasonally-adjusted basis. The slowdown was first evident in 2016 when permitting fell in nearly half of the nation’s 50 largest markets. While this slowdown suggests that the recent rental construction boom is softening, new rental starts nonetheless remain at a healthy level. 3. 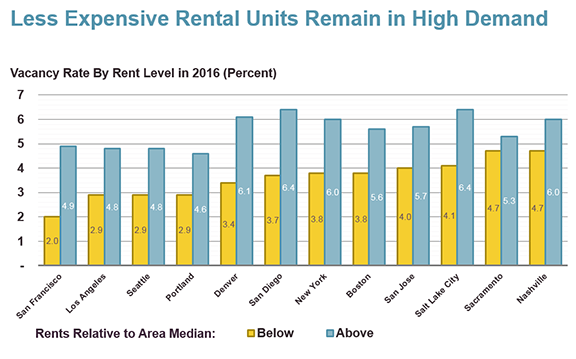 The rental market is softening, particularly for high-cost units. After declining for years, the national vacancy rate rose from 6.9 percent in the third quarter of 2016 to 7.2 percent in the third quarter of 2017. The softening is concentrated among high-cost units. RealPage data shows that the vacancy rate for Class A properties increased by 1.5 percentage points year over year through the third quarter of 2017, whereas the vacancy rate for Class C units ticked up only slightly and remains near its post-recession low. 4. Conversions of single-family homes to rentals have slowed. The number of single-family rental homes increased by 4 million between 2001 and 2016, driven by conversions of formerly owner-occupied properties during the foreclosure crisis. However, this trend moderated in recent years. According to the American Community Survey, 2015 was the first year since 2006 when the number of single-family rentals declined. While growth turned positive again in 2016, it remained well below levels of the prior decade. 5. The number of renter households jumped by nearly a third between 2004 and 2016. 6. Renter households with incomes over $100,000 account for 30 percent of growth over the past decade. While renters with incomes of $100,000 or more made up just 9 percent of all renters in 2006, they accounted for 30 percent of renter household growth through 2016. As another one of our interactive tools shows, this trend is particularly pronounced in high-cost metros. Renters with incomes over $100,000 accounted for 93 percent of renter household growth in San Francisco and 65 percent in New York City during this period. 7. Households over 50 accounted for more than half of renter household growth over the past decade. While renters age 50 and over made up 30 percent of all renter households in 2006, they accounted for 52 percent of renter household growth through 2016. In contrast, households under age 35 made up 42 percent of renter households in 2006 but accounted for just 24 percent of renter household growth through 2016. 8. Older renters are almost twice as likely to live in large multi-family buildings than in single-family homes. Among renter households age 75 and over, 48 percent lived in large multi-family properties (those with 20+ units) and just 26 percent lived in single-family homes. For comparison, across all rental units, just 21 percent of units are in large multi-family properties and 39 percent are single-family homes. Older adults’ preference for large multi-family buildings may in part reflect the improved accessibility features in these buildings such as no-step entry, single-floor living, and extra wide hallways and doors to accommodate a wheelchair. 9. Almost 40 percent of rural renters are cost burdened. In rural areas—defined as areas with less than 10,000 in population that are outside the Census-defined metropolitan and micropolitan areas—39.5 percent of all renter households are cost burdened, paying more than 30 percent of their income for housing costs. While this figure is below the 51 percent cost burden share observed in the nation’s nine largest metropolitan areas, it is striking because rural areas are likely to have the fewest obstacles to adding new units that would tend to keep housing costs down. As our online map shows, rural areas with relatively high cost burdens can be found throughout much of the country. 10. Low-income renters have seen their residual income decline by 18 percent since 2001. Renters with incomes in the bottom quartile of all U.S. incomes had, on average, just $600 left over per month in 2001 after paying for housing costs. By 2016, this figure fell to below $500, an 18 percent decline. In contrast, among renters with above-median incomes, income growth has outpaced the rising cost of rental housing, leaving them with more to spend after paying for housing than similar renters in 2001. 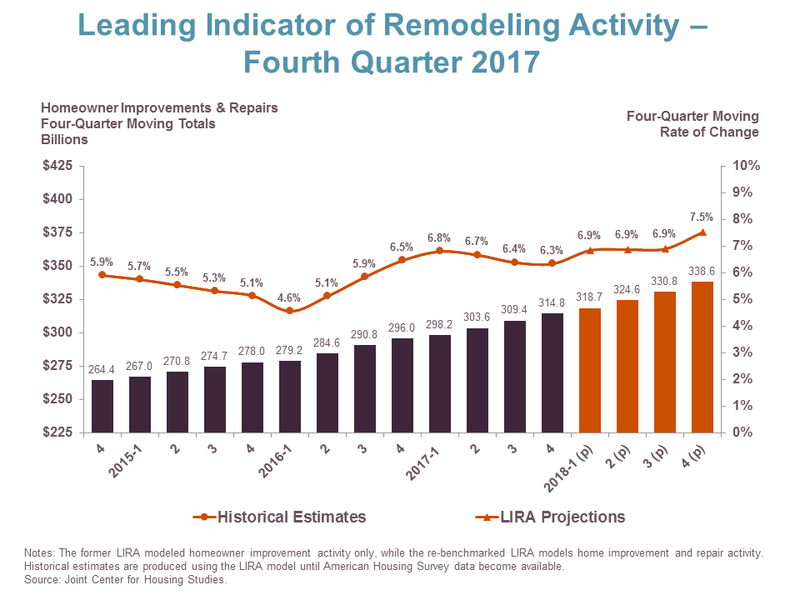 The coming year is expected to be another robust one for residential renovations and repairs with growth accelerating as the year progresses, according to our latest Leading Indicator of Remodeling Activity (LIRA). 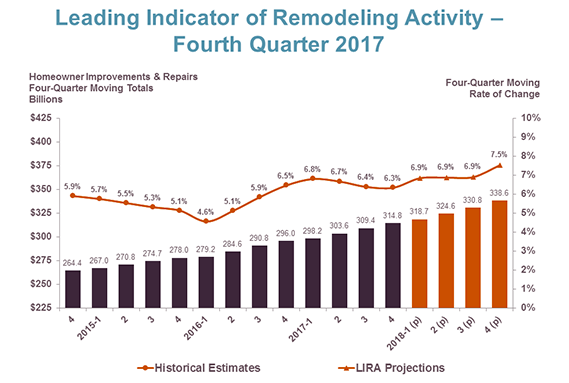 The LIRA projects that homeowner spending on improvements and repairs will approach $340 billion in 2018, an increase of 7.5 percent from estimated 2017 spending. Steady gains in the broader economy, and in home sales and prices, are supporting growing demand for home improvements. We expect the remodeling market will also get a boost this year from ongoing restoration efforts in many areas of the country impacted by last year’s record-setting natural disasters. Despite continuing challenges of low for-sale housing inventories and contractor labor availability, 2018 could post the strongest gains for home remodeling in more than a decade. Annual growth rates have not exceeded 6.8 percent since early 2007, before the Great Recession hit. While the efficiency offers consumers many opportunities, the complexity makes it more likely that consumers will make housing and mortgage choices that are not in their best interests. However, our experience at NeighborWorks® shows that housing counseling programs can greatly increase buyers' ability to find and finance homes that are right for them.